1. 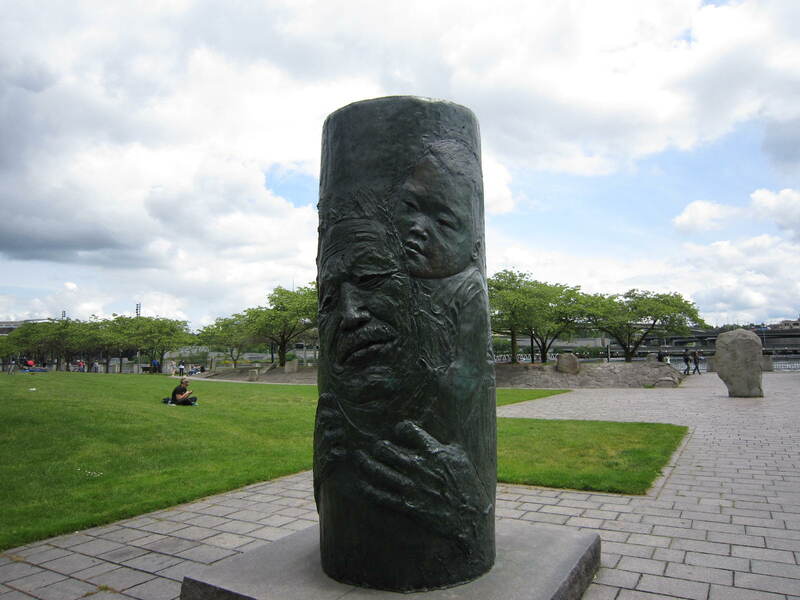 In my post last night about A Day in Portland, I mentioned our visit to the Japanese American Historical Plaza along the Willamette River and included a photo I found online. Gail reminded me that she took photos, which I have now put on my computer. Above you can see, in the foreground, one of the sculptural columns made by Jim Gion. In the background are some of the plaza stones with poetry on them. 2. 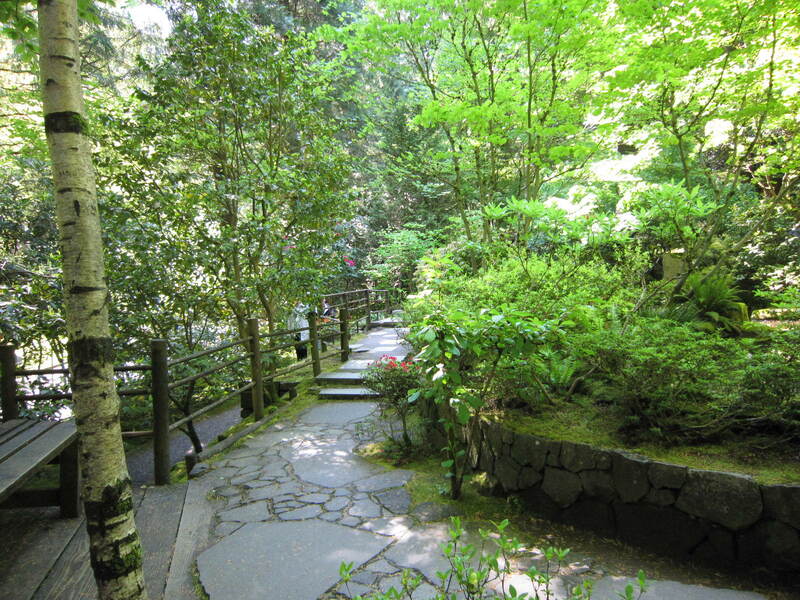 In that same post, I described our visit to Portland’s Japanese Garden and inserted a photo from their website. Below, another photo, taken by Gail on Saturday. 3. I wrote earlier today about the rabbit who paid us a visit Monday during our holiday barbecue dinner and included two photos I took. 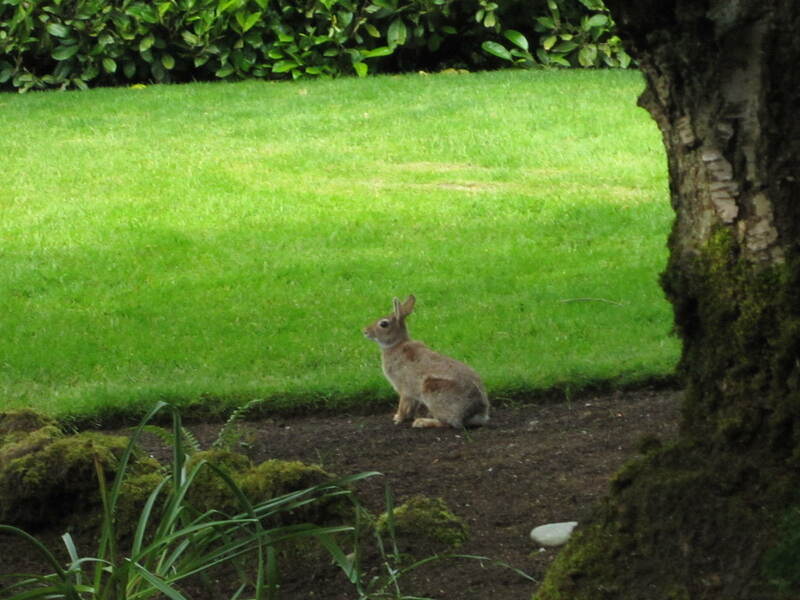 Below is one that Gail took, with the rabbit sitting under our cherry tree. 5. My Portland posts covered Friday and Saturday. What about Sunday? We didn’t go anywhere, so there’s not a lot to tell. Our nephew DJ came by the hotel with his two children and we had breakfast downstairs in the Heathman Restaurant. After a leisurely meal, we all went up to our hotel room to chat some more. 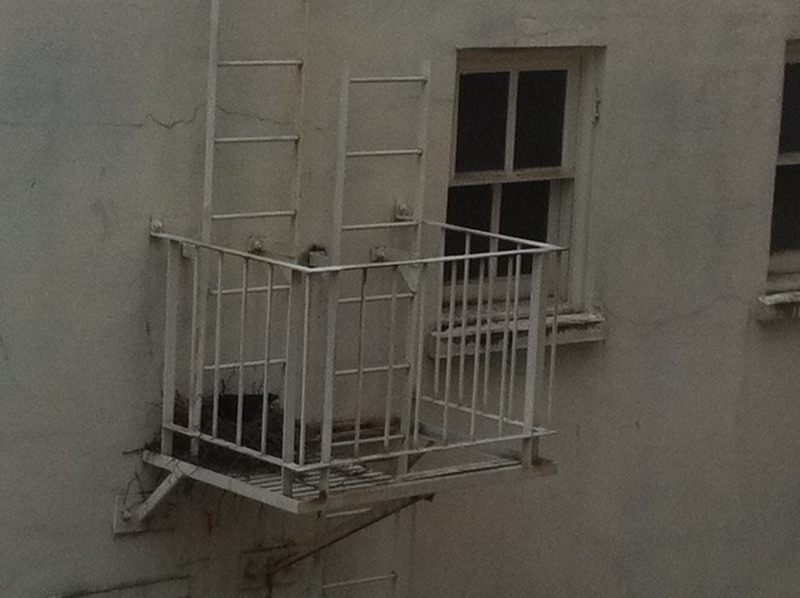 I can now refer to a couple of photos I took through the hotel room window. As I explained in my post about the Tony Bennett concert on Friday night, our hotel is next to the Arlene Schnitzer Concert Hall. The hotel runs north-south along the west side of Broadway. At it south end, again on the west side of Broadway, is the entry to the hall. One heads westward through the entryway/lobby to the hall itself, which proceeds to run northwards parallel to the hotel. So, if one looks down on the block, one sees two parallel structures, the hotel and the hall, with some space in-between. From the room, we look straight out west, over the space, into the facade of the hall. 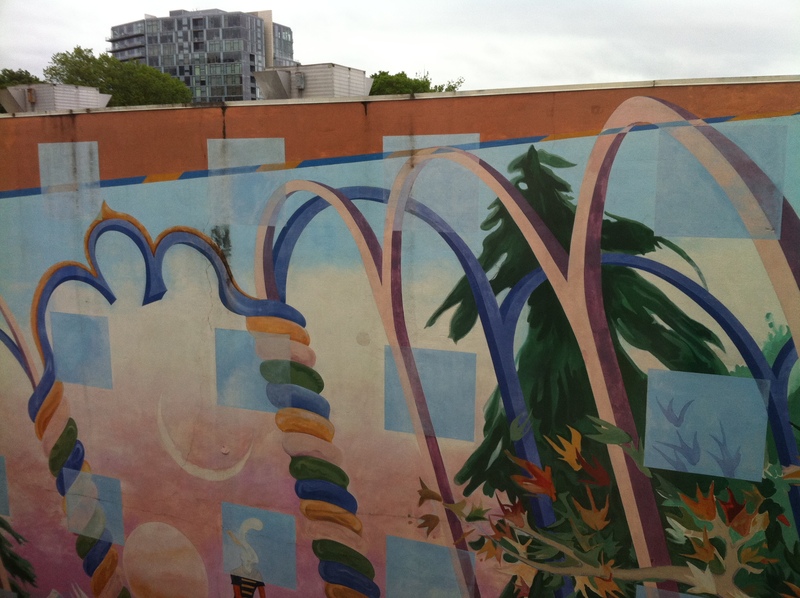 As you can see, it has a huge mural on it to make the view less painful. And at our height on the 8th floor, we could even see over it to the southwest, with hills rising just on the edge of downtown Portland. We had looked out at this view many times since our arrival on Friday. And I had seen as well a little landing to the right, with a stairway leading up to the roof and down below. What I hadn’t seen until we were back in the room with DJ and his family on Sunday was what sat on the landing — a giant crow’s nest. It turns out that as obvious as the nest should have been, it’s a lot more obvious when the mother crow is sitting in it. Sunday morning, I saw the crow sitting on the edge taking care of some sort of business, whether nest construction or baby feeding I couldn’t see. Then she flew away, then she came back and sat down. She’s a bit hard to make out, but she’s in the photo below. 6. Once our guests left, we packed up, checked out, got in our car, and headed north to Seattle. We would have been home in 3 hours, but as we hit Federal Way, Gail suggested I see if Jessica and Joel, whom we understood were planning to see a movie together, were out of the movie and wanted to meet us in Tukwila for a very early dinner. I texted Joel, without even mentioning where we might meet, and he texted back right away suggesting the very place we had in mind, Bahama Breeze. For reasons I can’t explain, I love eating there. Not enough to drive all the way down from home, but enough to think of stopping in when we have business down by the airport or environs. 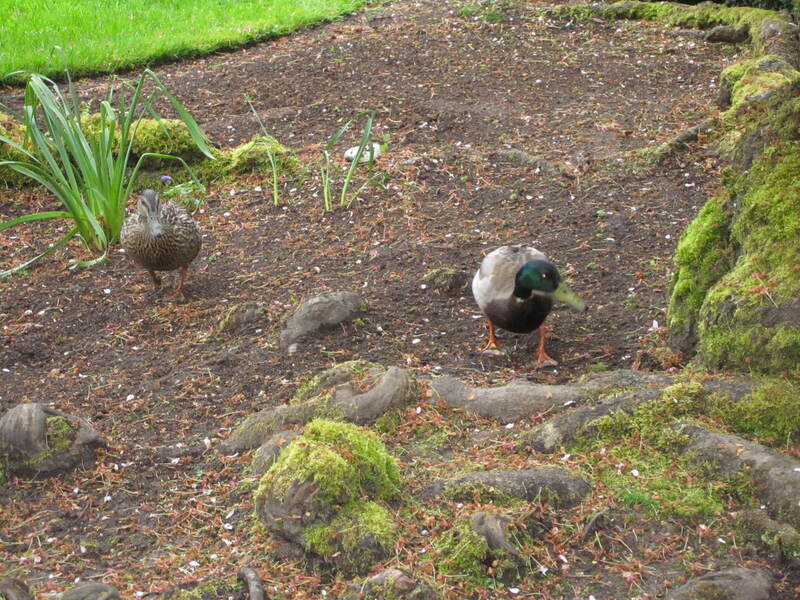 And I hadn’t been since Gail had to go down to adjacent Southcenter Mall last August to pick something up. So that’s what we did. My affection for Bahama Breeze is part of my larger fascination with the Darden family of restaurants, which I wrote about a long time ago. Red Lobster. Olive Garden. Bahama Breeze. Capital Grille. And then there are two that have yet to make it out this way: LongHorn Steakhouse and Seasons 52. Some day we’ll try them. 7. You may be wondering how the NCAA men’s lacrosse championship ended up. I suspect not. But having described or at least stated the result of every game in the tournament other than Monday’s championship, I should perhaps close the loop. It was an exciting game. Maryland scored first, then Virginia came back with two goals, then Maryland with 2, then Virginia with 2, making the score 4-3 in favor of Viriginia. But then the alternating pattern came to an end, as Virginia scored two more goals to take a 6-3 lead early in the third quarter. They seemed to have the game in hand. Maryland had other ideas though and scored 3 goals of their own while holding Virginia scoreless over the next 15 1/2 minutes to tie the score at 6-6. Virginia came back with goals 1:30 later, about 5 minutes later, and again with just under 2 minutes left in the game, taking an insurmountable 9-6 lead. Maryland scored again with 16 seconds left, but that was it. 9-7 Virginia for their 5th national championship, the 4th under coach Dom Starsia. This after needing a furious comeback for their overtime victory over Bucknell in the first round, and after turning around a season that seemed headed to mediocrity halfway through. With this, I will bring my discussion of the Portland trip, the neighborhood animals, and 2011 men’s lacrosse to a close.